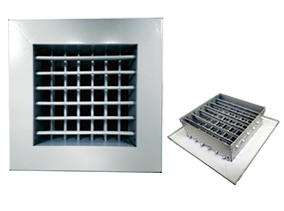 Square / Rectangular Ceiling Diffuser is the most popular air outlet in the air-conditioning field, it has a constant air flow characteristics and simplicity appearance. 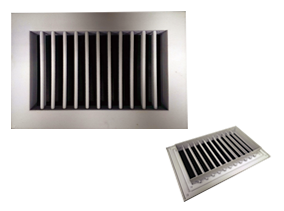 In order to meet customer needs, rectangular shape also available for increasing the rate of air flow. On the other hand, customers are able to customize the style of diffuser (from one way to four ways) to accommodate with different ceiling. An O.B.D can be assemble to the back of diffuser in order to control the volume of air flow. Moreover, the user friendly design - removable core, was designed for easier installation or job cleaning. 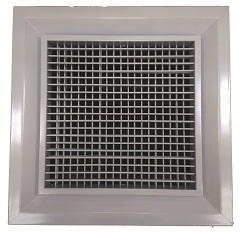 Turriform Double Diffuser able to deliver the air into four different ways, but also allow user to adjust the direction of air flow. This is a fusion of Square / Rectanglar Ceiling Diffuser (Frame) & Double Deflection Diffuser (Core). Users are able to select the diffuser either Focus on Four Ways or Direction Adjustment. Moreover, the core of Square / Rectanglar Ceiling Diffuser and Turriform Double Diffuser are able to swap and install without any problem. Single Deflection Diffuser are in the same clan. 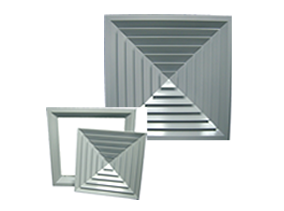 Single Deflection Diffuser only has one layer of blade for changing the direction of air flow by adjusted it Up and Down (or Left and Right). Due to the limited air flow adjustment, Single Deflection Diffuser wasn’t as popular as Double Deflection Diffuser. However the emergence of flangeless design has started to replace O.B.D / V.C.D, in order to adjust the volume and direction of air flow (It can be installs inside the air pipe, and covered by Linear Diffuser). Single and Double Deflection Diffuser are very common in used, both can be use on the ceiling or wall. Double Deflection Diffuser is one of the popular air outlet have been used. Although It has an unwelcome appearance, but its strong air flow capacity is the only reason why people select it. The design of double layers of blade are allows users to adjust each single one Up and Down, Left and Right individually. They are not only able to change the direction of air flow, but the distance and volume too. Double Deflection Diffuser is different to the Square / Rectangular Ceiling Diffuser, it can be installs on the ceilling or on the wall without any issues. 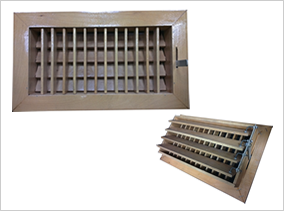 Double Deflection Diffuser with Handle is an innovation which is base on the design of Double Deflection Diffuser. It is a combination of O.B.D / V.C.D and Double Deflection Diffuser, with the design of turnable rear blades, users are able to adjust the volume and direction of air flow easily.